Tosot 12000 BTU Portable Air Conditioner with Heater + WiFi control can keep your home cool, warm and dry with 12,000 BTU air conditioner, 9500 BTU heater and dehumidifier. The 12,000 BTUs of cooling power keep a room up to 450 sq. ft. cool and comfortable and the 3-speed heating, cooling and fan and 2-way air direction help spread the air evenly throughout the room. The WiFi is an ideal device to control and monitor your home climate with your smartphone or through any other IFTTT platform connected appliances. Digital controls offer precise temperature adjustments, and the remote control lets you control the air conditioner from across the room. The programmable thermostat let you adjust the level of cool or heat for comfort during summer or winter. The dehumidifier can remove moisture from the air to reduce stickiness. Best of all, features like a 24 hour timer, sleep mode and auto mode save energy for efficient and affordable operation. The LG Electronics 14,000 BTU Portable Air Conditioner with Remote features a dehumidifier that removes moisture from the air. It is equipped with casters that allow for easy movement to the spaces that need chilling, this portable AC unit also includes a remote control for easy temperature, fan speed and timer adjustments from across the room. This machine boasts 2-way up/down air deflection that circulates air evenly to eliminate hot spots, providing ample airflow to cool spaces up to 500 sq. ft. Note: the freestanding unit must stay upright for 24 hours before use, must be vented to the outside (window installation kit included with detailed instructions) and cannot be used with extension cords. Whether you're lounging in the living room or working in the office, this portable air conditioner from Perfect Aire will keep you cool and comfortable. With a 12,000 BTU capacity, this unit swiftly cools up to 550 square feet and rolls with ease on casters to bring relief where you need it most. Tailor your comfort exactly to your liking with adjustable temperature settings and variable fan speeds that you control from the unit or your handy remote. Heading out, or up to bed? Automated modes will keep you in your comfort zone with utmost efficiency. Just set it and forget it. 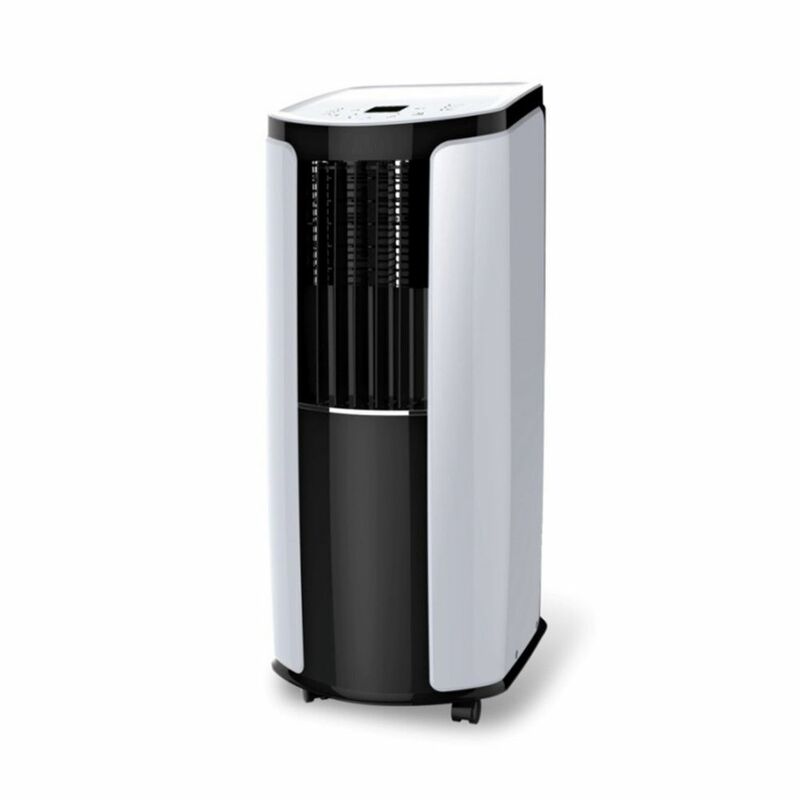 12000 BTU Portable Air Conditioner with Heater + WiFi Control Tosot 12000 BTU Portable Air Conditioner with Heater + WiFi control can keep your home cool, warm and dry with 12,000 BTU air conditioner, 9500 BTU heater and dehumidifier. The 12,000 BTUs of cooling power keep a room up to 450 sq. ft. cool and comfortable and the 3-speed heating, cooling and fan and 2-way air direction help spread the air evenly throughout the room. The WiFi is an ideal device to control and monitor your home climate with your smartphone or through any other IFTTT platform connected appliances. Digital controls offer precise temperature adjustments, and the remote control lets you control the air conditioner from across the room. The programmable thermostat let you adjust the level of cool or heat for comfort during summer or winter. The dehumidifier can remove moisture from the air to reduce stickiness. Best of all, features like a 24 hour timer, sleep mode and auto mode save energy for efficient and affordable operation.